For over 100 years, Shepard's Citations have been a cornerstone of the legal research process. 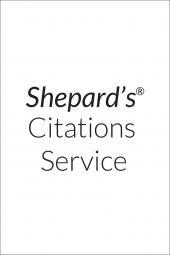 Expand your citations universe to include authority from other states with Shepard's Pacific Reporter Citations. You can Shepardize any Pacific Reporter citation to quickly determine where it has been cited and how it was treated. Determine if other state courts have cited a decision from your state, or if a court in your state has cited a neighboring court's decision. • Covers Alaska, Arizona, Colorado, Hawaii, Idaho, Kansas, Montana, Nevada, New Mexico, Oklahoma, Oregon, Utah, Washington, and Wyoming. • Be sure your case is still good law by using Shepard's time-tested, reliable legal analysis to check the current status of your authority. • Find additional supporting authority, including citations from all states, the U.S. Supreme Court and lower federal courts. Your all-inclusive subscription includes regular cumulative supplementation, plus any hard-bound publications issued, for one year. Subscribe today and unlock the power of Shepard's and LexisNexis, the names you can trust for all your legal research needs.